Heat oven to 350 degrees. Grease 10 regular-size muffin cups. In a large bowl mix shortening, 1/2 cup sugar and the egg. In a medium-size bowl mix flour, baking powder, salt and nutmeg. Add flour mixture alternately with milk to the creamed ingredients. Fill muffin cups 2/3rds full. Bake 20 to 25 minutes or until golden brown. To make the topping, mix together sugar and cinnamon. Melt butter in a shallow bowl. 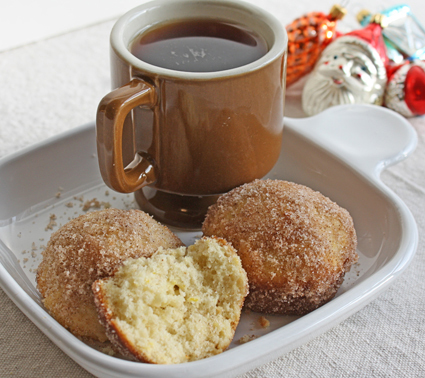 Roll hot muffins in the melted butter, then in the cinnamon-sugar. Yummy variation: Add 2 tablespoons finely chopped nuts to the topping.